Februari is over and it's time for a brand new Dailystills. Who knows what the weather will bring in March... Anyways, There is always time for photographs. So take you camera or phone and go! 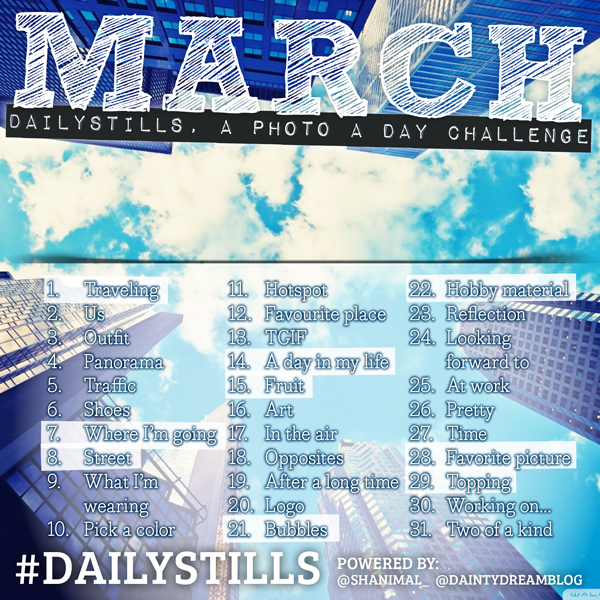 Here are the prompts for March. Enjoy! Are you joining us in March? Let us know on Instagram :) My IG account: @shanimal_ and Mandy's: @daintydreamblog. You're allowed to save this photo and share it on Instagram too, enjoy! ♥ Take a photo using the prompt as inspiration. So for March the prompt for day 1 is ‘Traveling'. So take a photo when you were on vacation, when you go to work or just traveling around!